See scan - very good condition. 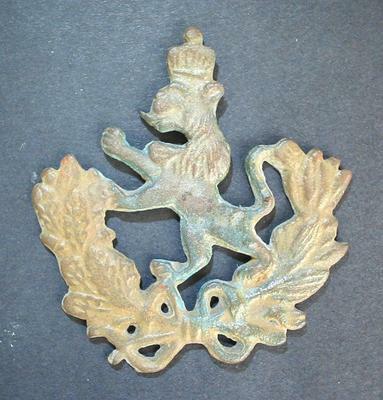 This is an extremely scarce and rare Bulgarian and Russian badge as given to volunteer soldiers during the Russian Turkish war that brought Liberation to Bulgaria from the Ottoman Turkish Empire. The badge is cast bronze with original patination and measures 45mm x 50mm and shows a crowned Bulgarian lion surrounded by wreaths. Lifetime Guaranteed Authentic piece. Absolutely scarce militaria / military collector piece and one of the rare Bulgarian and Russian campaign badges and decorations.